This book was designed 100% by my very creative customer. She wanted a book to use when propsing to her girlfriend that incorporated a heart monitor EKG design. She only wanted lettering on the back cover "and then I meant you"...meaning her heart didn't truly start beating until she and her partner me. Awww...I love my customers. I found some funky copper endpapers that kind of look like cells under a microscope (continuing the medical theme) and I continued the EKG lines raised across the spine and onto the back cover. I'm not crazy about making things with hearts on them, but I loved this one. 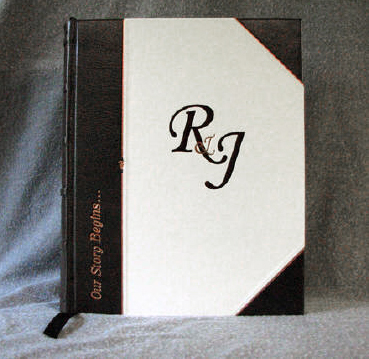 This book was designed to be written-in, as well as to hold an engagement ring for a proposal. 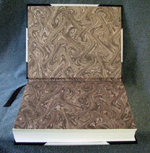 My cusotmer wanted a very classic 3/4 binding with lots of personal touches. 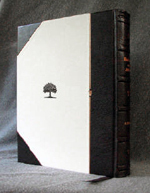 The book cover consists of dark brown goatskin leather and eggshell linen book cloth. The cover is accented (front and back) with copper lines, several decorations stamped using custom metal dies, and lettering in copper foil. 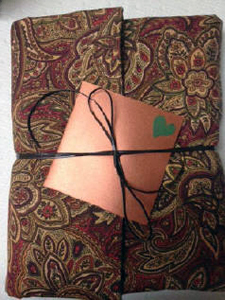 My customer went on to customize the inside with her own artwork and she also made a lovely cloth wrap that would protect the book over the years. These projects are truly collaborations and this one is a good illustration of why I enjoy that aspect of this work so much. 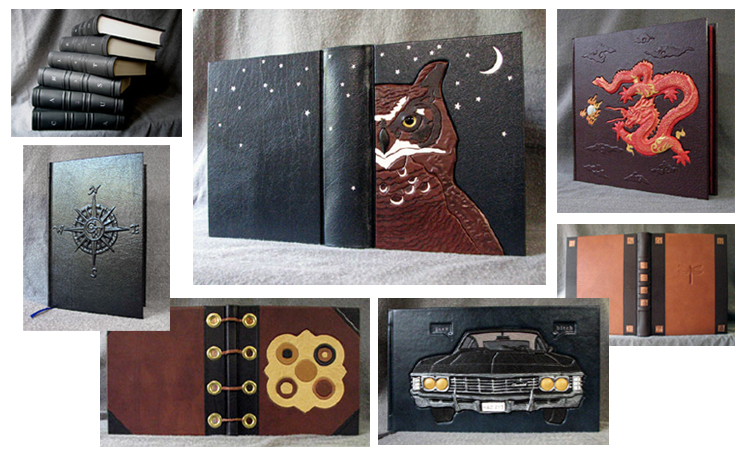 I like to make something that my customer is picturing and I love to see what they do with the book and how they make it their own. This was a very unique order by a customer who had some very specific requests. 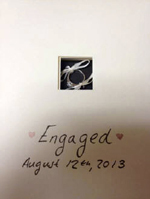 This small book was created to hold an engagement ring for a proposal, but my customer wanted to be the one who cut the recess out of the pages for the ring. My customer sent me an image of a specific calligraphy-style hummingbird that he wanted on the front cover as well as a photo of a specific steam engine for the back cover. The hummingbird on the front is raised, and the raised steam engine on the back is set into a recessed area so the book can still lay flat on its back on a table. This was a VERY intricate raised desing to carve on a relatively small scale. My customer wanted to incorporate green and purple into this project in some way, so the ribbon page marker is green and the endpapers are purple.